Orders page displays a history of all orders placed on your website. 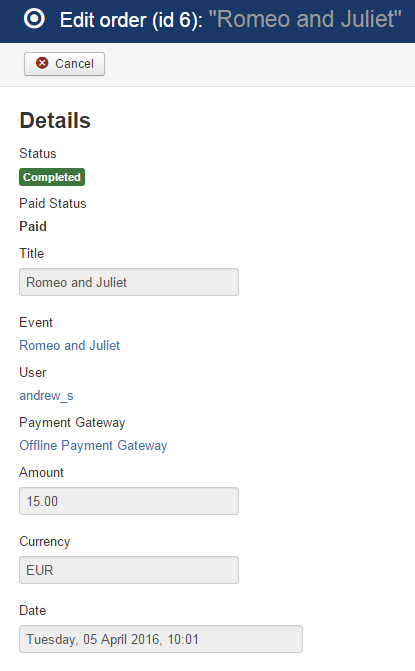 Here you can see the event title, the user registered, the payment method used, the amount, the date, the order id and the status (if the order was completed or not, if it was paid or not). Orders can be confirmed automatically based on the gateways used, the respective payment processor must support IPNs (Instant Payment Notifications). In case a payment was made for an order through other payment gateways which don't support IPNs, select it and press on Mark as Paid to confirm the payment. If an order is marked as pending, then the site administrator can change manually the Order status by checking the order and click on Mark as Completed or Mark as Failed. Clicking on the order's title will display all its details on a new page. When a payment is processed by the gateway it will be displayed on the Payments section. A Filter is available that helps you find payments made through a specific payment gateway and you can also filter them by the payment status. * Notifications are also available for orders and payments and they can be configured from the Notifications Section.